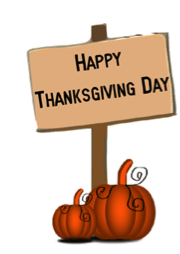 Thanksgiving is a day for spending time with family and friends as well as sharing culinary delights, such as turkey, dressing (a Mid-Western word for stuffing), mashed potatoes, sweet potatoes, corn, relish trays, salads, cranberry sauce, and pie for dessert. I still have nostalgic feelings for the days when Thanksgiving was about the only holiday that hadn’t been ruined by commercialization. I like the holiday and cherish childhood memories. In my family, there was never talk of the Pilgrims or any national Thanksgiving folklore, as it was more or less celebrated as a religious holiday, as a day to give thanks for all of life’s many blessings. After eating a Thanksgiving feast, the majority of the family on my mother’s side played 500 (a card game) literally for hours, while others watched football games and Thanksgiving parades. But each family who celebrates Thanksgiving will have their own traditions. Another great aspect about Thanksgiving is that you don’t have to be American, of course, to enjoy a good Thanksgiving meal. If you need some tips for making the perfect bird and the trimmings, you’ll find a wealth of information on the homepage of one of America’s favorite cooks. Believe it or not, on Martha Stewart’s homepage, you’ll find thirteen ways to cook a turkey and 30 meatless Thanksgiving recipes for our vegetarian friends. And for those of you who find her recipes somewhat intimidating, I’d like to share a simple recipe for cranberry sauce with you. After all, placing cranberry sauce from a tin can on the Thanksgiving dinner table is sacrilegious, almost as bad as wearing white shoes after Labor Day. Pour the sugar and water into a saucepan. Stir the mixture until the sugar has dissolved and then bring it to a boil. Add the washed cranberries and cook them for 10 minutes until they are soft. Increase the heat slightly and cook for another two minutes or until the cranberries burst. Then reduce the temperature until the mixture begins to thicken. Remove the saucepan from the stove and add a handful of walnuts, if you wish. Pour the cranberry sauce into a decorative bowl, and allow it to cool to room temperature before placing it in the refrigerator. This dish can also be served with vanilla sauce, ice-cream, or yoghurt as a dessert.